This is an Holiday Rail Model Train Set HO Scale from Life-Like Trains. Retail $153.99 SAVE 24% ! 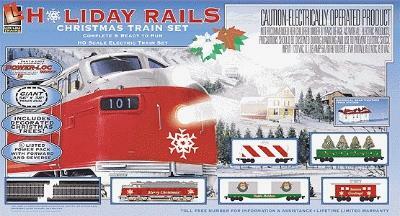 A complete set in a single package the Holiday Express comes with a 56 x 38" 140 x 95cm oval of Power-Loc track that includes a terminal rerailer, UL-listed power pack with forward and reverse, plug-in terminal wires, extra couplers and complete instructions. Here's the perfect train set to re-live holiday memories or start a new tradition! Designed for quick and easy set up, the Holiday Rails looks great under the tree or adding animated action to a Christmas village display. A powered F7 diesel engine with working headlight leads this festive freight train. There are four Christmas-themed railroad cars including a matching eight-wheel caboose. For the finishing touch, there's a snow-capped snap-together train station building kit and four multi-colored "decorated" Christmas trees.